A unique house in west Cornwall is one of 40 landmarks throughout the country being opened this weekend to members of the public. 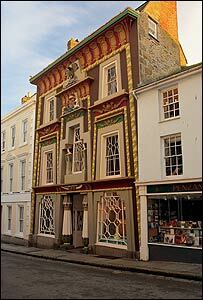 The Egyptian House in Penzance will open its doors as part of the Landmark Trust's 40th anniversary celebrations. The Egyptian House in Chapel street in the town was built in 1835 as a museum and geological repository. The building will be open from 1030 BST to 1630 BST and admission is free for all visitors. Its colossal facade with lotus bud capitals are made of Coade stone and it is a rare survivor of a style that became fashionable after Napoleon's campaign in Egypt in 1798. This weekend visitors will be able to look inside the building and learn more about its architecture and history. The event is part of the Landmark Trust's Open Doors weekend. The trust was founded 40 years ago to rescue and restore interesting and historic buildings at risk around the country. Peter Pearce, Director of the Landmark Trust said: "Open Doors will be a very special weekend for the Landmark Trust. "We hope many thousands of people who share our passion for architecture and history will join us in celebrating 40 years of Landmark bringing new life to buildings that would otherwise have been lost." What now for Brighton's West Pier?